This week's creative space harbours some eleventh-hour craft. I am hoping that all this fabric, piping cord, nylon and continuous zippering will turn itself into two backpacks, before daybreak tomorrow. You see Argy and Bargy have both started kindergarten this week. Argy is attending 4 year old kindergarten, while Bargy has joined a three-year-old group. They are incredibly excited, while I am feeling a little wistful. But I digress: whilst excited, the boys still don't have new kindergarten bags. Its quite difficult to find suitably-sized backpack for preschoolers. The cute, compact types hold little more than a folded handkerchief and some fresh air. By contrast the larger sizes, will hold a lunch, a hat, a jacket, some tissues, 5 pieces of artwork and a full change of clothes. They also have the effect of making a small child look like a backpack on legs. The solution? Something tailor-made from the Toddler Backpack pattern by Made by Rae. I first saw this very cute backpack being sewn by Angie and then Nikki. I couldn't resist jumping on the bandwagon, especially as the pattern is very reasonably priced (USD$6) and uses only a modest amount of fabric. 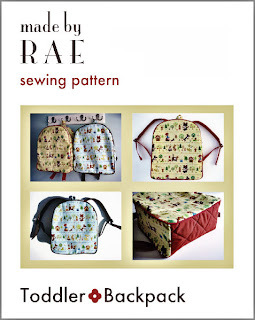 The bag is a designed for 2 - 5 year olds, but comes with instructions for enlarging the pattern. I've added a little extra depth, width and height to all my pattern pieces. Now I am just looking for that window of craft serendipity to do the sewing. The backpacks will be so cute - I love your choice of fabric. that pattern looks great! and cute fabric too! 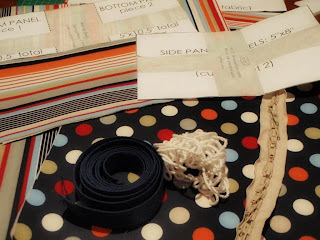 I have never used continuous zipper beore - but I have to admit I find it a bit fascinating! A great project. I found finding backpacks for boys, well nice ones that is without disney characters, really difficult. And here's hoping for some serendipity of some sort from only having one at home. Oooh Argy and Bargy must be super excited about their new kinder adventures. Hope they have a great day! Commiserations on the lack of overlap times. Bring on school, eh? Or will that mean a return to 'responsible' work? I hope not! Hope you made the deadline, Liesl - and that you do manage to carve out some 'me' time in your day. And I bet the boys are grateful not to look like backpacks on legs! It always makes me feel sad to see little kids burdened like that. Hope you are all having fun. I operate best with this kind of deadline. Trusting it all worked out OK. Shall reload & find out.